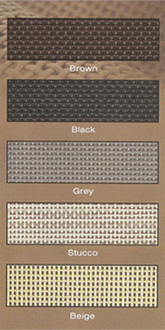 Phifer Suntex 80 and 90 grade available in an array of colors. Excellent for use on Windows, Doors and Porches. Solar Screens protect your home and save on A/C electric costs by blocking solar heat gain and UV rays before they enter through your windows. The chart to the left shows a window with brown SunTex installed. In midsummer as much as 230 BTUs can fall on each unprotected square foot of glass. With SunTex installed, up to 90% of the suns heat and glare is reflected, absorbed and dissipated before it strikes the window. What are the bonus benefits of having Phifer SunTex solar screens on your home? Below is a list. Protects against fading and sun rot. Lets in soft light and breezes. Affords full vision from inside with daytime privacy from outside. 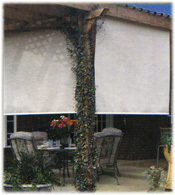 Made from Phifer Suntex 80 fabric these Roller shades can also offer an exterior protection to homes and can be used for pool enclosures, decks, patios, porches, balconies and sun rooms as well. The great thing about the roll up shade is the outward visibility. WHile also offering privacy. These shades come in several colors including Stucco and black.